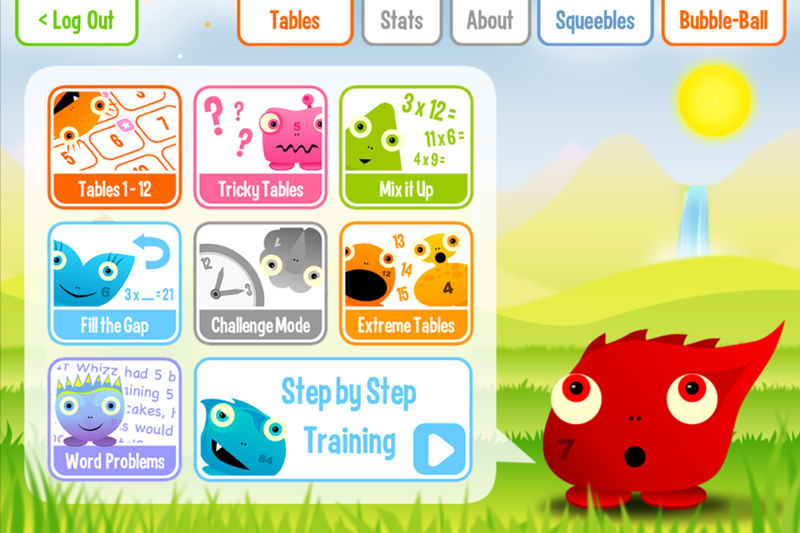 Our Squeebles Times Tables app offers a fun way for children to learn and practise tables, helping Whizz to rescue 40 of the Squeebles from the nasty Maths Monster as a reward for their hard work. Featuring a great reward system, fun mini game, 8 tables modes, unlimited players and plenty of stats and reporting for parents and teachers. As usual, no in-app purchases or adverts. Tables 1 - 12: answer questions across all the basic tables sets from the ones to the twelves. The first time all 12 questions within any one set are answered correctly, the Maths Monster will release a Squeeble. Tricky Tables: whenever a question is answered incorrectly, it gets stored in this area. So, at any time, your child can be tested on the tables they found difficult. Once they get a "Tricky Table" right 3 times in a row, it is removed from this area. Mix it Up: a completely random set of 12 questions from all the tables sets is asked (parents and teachers can set certain questions not to appear so as to personalise the test for each child). Once your child is confident answering the questions from each of the tables sets individually, this type of quiz can be used to consolidate their knowledge. Six Squeebles are available for reaching various milestones. Fill The Gap: this mode is slightly different in that it gives you the answer and asks that you fill in the gap. So, a sample question might be 7 x ? = 63. 12 randomly selected questions are asked (again, tables can be excluded to customise for each child), with five Squeebles to win in this mode for reaching various milestones. Challenge Mode: there are 30 challenges to work through, split across 6 different levels. Each challenge is harder than the last, with 6 Squeebles to rescue in this game mode. Extreme Tables: some of you wrote to us asking if we could include the 13, 14 and 15 times tables in the app, so we did! This game mode tests you on those "extreme" tables, with 5 Squeebles available to rescue in this game mode. Word Problems: questions in this mode are given in word problem format rather than as traditional number based questions, for example: "James gives 5 biscuits to each of his 6 friends. How many biscuits did James give out in total?" Step-by-Step Training: children are introduced to only one times table question at a time and only move on to learning the next one once they can answer it with confidence, along with any other questions from that particular times tables set your child may have already successfully memorised. Because memorising tables is a necessarily repetitive task, we've built in a fun, 20-second 'brain break' game within the training mode, so that children feel motivated and enthusiastic to continue to learn. By doing well in their tables, children earn turns on a fun mini-game called "bubble-ball". This is a game the Squeebles love to play which involves a Squeeble sitting in a bubble-ball (a flying machine the Squeebles invented) and being flicked through the air by the tail of a flipfish (a big fish that lives in the lakes and rivers on Squeeble Island). Stars (which are also awarded for doing well in your tables) can be traded for better bubble-balls and stronger flipfish to use in the game. In addition, bubble-stones (gemstones hidden on Squeeble Island) are awarded for reaching certain learning milestones. These stones help Squeebles fly further on their bubble-balls. 6 Squeebles for completing full marks on each of the levels in 'Challenge' mode. In addition there are other rewards (bubble stones, stars, bonus awards) for completing various other challenges. Have fun discovering them! The parents' zone allows teachers and parents to register new players, view stats and progress for existing players, set certain tables to be excluded for each child, manage player settings, view each player's tricky tables and more. We've updated this section to include a lot of features you asked for from the first version of our times tables app. This area can be password protected to stop your little people going in there! Unlimited profiles can be created on any one device, making this perfect for use in the classroom as well as at home. As with all our apps, there are no in-app purchases, no adverts and no internet links of any kind within the app. "To all parents this is an amazing app to help your kids learn their times tables - I have two children 7 and 9 and they play this app every day, you can imagine how easy it is to practice their tables with them and how much progress they are making. I don't write reviews very often but the developers of this one really deserve the praise, and they keep developing it with new ideas to keep the children coming back - buy it you won't regret it." "Just to let you know that we LOVE the training mode on Squeebles. It’s repetitive enough to get the information learnt but with the added fun of the game in-between." "Squeebles strikes again! My son had loved/loves playing Squeebles Spelling. After using it, he never scored less than a 100% on any test. So when my (now) 8yr old was struggling with times tables, I downloaded a bunch of multiplication apps. They all had some problem. They were either basic & boring, too childish for my "cool kid" or too much game and not enough learning. This game, however, was just right. My son liked saving/collecting the squeebles and reading their style/strengths the way he does Pokemon cards. And he learned all his times tables thru 12 in two sessions after struggling for weeks. I also like how the play is limited, if he wants to play more, he has go earn it by doing the times table challenges... And he enjoys doing both parts, the times tables & the bubble game. Really well done! I highly recommend this app and the spelling test one. "This is the best I've come across for teaching times tables. The incentives are brilliant and my grandson plays it very happily to earn the little characters and the tail flip game. It plays in beautifully to the things young children love to do - teaching the tables along the way. I bought it on my iPad to try and get him to learn his tables and after one go he pleaded with me to buy it for his iPad. Brilliant! "This is by far the best educational (but fun) app I have loaded for my kids. It is a brilliant way to practice their times tables (or even to learn them if your kids are a little younger) . I wish there were more apps out there that were this good, fun, thorough and easy to use." "I now have a 6 year old who knows multiplication, and begs me to play Squeebles Fractions. What's a parent to do when their children fall in love with math? The creators of Squeebles have found an excellent balance between learning & fun, between education & rewards, and between prizes & games. Additionally, unlike some applications, the content is clean, the graphics are nice, and the gameplay is smooth. Updates have added both extra funtionality and features. Buy Squeebles? Yes." "I am 10 and I use this app all the time. It is one of the best ever apps made." "This is the best maths app ever because it help young kids to learn their time tables (and division and everything else)I would highly recommend this app who ever was the inventor of this game thank you ever so much it's helped my child so much. thanks"
"It really works in encouraging kids to learn by being fun and rewarding." "I loooooooooooooooooooooooooooooove this game soooooooooooooooooooooooooooooooooooooooooo much I'd recommend it to math lovers like me." "Easy to use and encourages kids! Happy with purchase!" "Great for gaining children's interest in maths. Enough said!" "My daughter seems to be allergic to learning times tables. After being called into school about it I was desperate, and downloaded every times tables app going. This is by far the best for our family, it is really good fun! Have now downloaded the division, fractions and spellings apps too." "Awesome! Loads of settings to cater for capable and not so capable maths students. Loads of fun and is teaching my 5 and 7 year old sums that, up until my squeebles addiction, would have got me thinking too!" "Great app and so child friendly. I am a teacher and intend to use this as a motivational tool to help my class learn their times tables!" "My moshi monsters mad daughter loves this app. It's very straight forward easy to use and through rewards keeps my daughter entertained." "Can't believe our 8yr old daughter is actually asking to do this first thing in the morning - even before breakfast! Fantastic way to learn times tables through rewards and really connects with her obsession for collecting characters." "Fantastic, colourful app that really does seem to be helping my child learn his tables. He loves collecting the Squeeble characters as he answers tables." "My children love this app and we've seen noticeable improvements in my daughter's maths ability since she's been practicing on it. Had a minor compatibility issue with Sony Z2 tablet + restricted mode, but the developer fixed very quickly. Keep up the good work!" "Love this app! It's been great for helping my kids learn their times tables in a fun way!" "Fantastic game, which my son loves to play. He loves collecting the little squeebles. We are having a race to see who can collect them all. (done wonders for me too!)" "Absolutely brilliant. I would recommend it to all parents trying to get their 8 year olds to learn their times tables. Well worth 69p... I'm going to buy more from squeebles! We both Love it." "This game is really good. I like collecting the Squeebles and my mum likes it because this makes me want to play for longer and to try again when I make mistakes." "This app is great for kids like me. There is easy and hard modes and mixitup mode too. I love it (Above written by my 9yr old daughter!)" "I downloaded this for my 10 year old so she could brush up on her times tables in preparation for SATS. She loves it and I practically have to wrestle my phone off her! The little characters are very cute and it's obviously very addictive." "Bought this for my daughter who is 9 and struggling with the conventional way of learning her tables. She loves this app and saving the characters is a great added bonus to encourage learning. You won't be disappointed with this app." "This is helping our son steam through his 'cracking times tables' at school. He actually enjoys practising! Thanks...."
"Simple and fun to use. My children actually enjoyed doing their times tables and that's never happened before! Thanks." "So pleased with this. My 6 year old daughter has really enjoyed it and is learning her tables much quicker as a result." "Lovely fun way to learn the timetables - just what I was looking for!" "Just because of this app my son has learned the 12 times table."